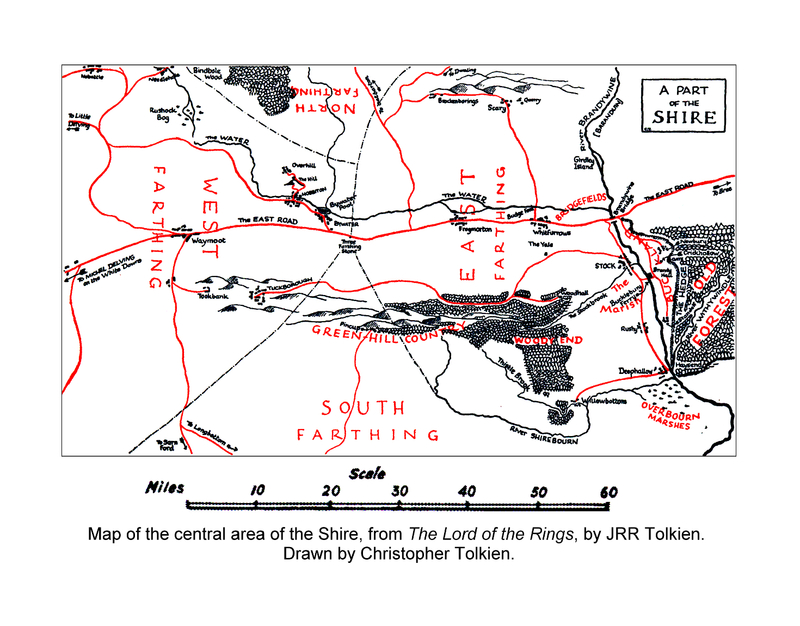 Location: The original Shire, between the Brandywine and the Far Downs, divided into four quadrants; excludes the Eastmarch (Buckland) and the Westmarch. The four farthings of the original Shire. The Shire was divided into four quarters, the Farthings already referred to, North, South, East, and West; and these again each into a number of folklands, which still bore the names of some of the old leading families, although by the time of this history these names were no longer found only in their proper folklands.... Outside the Farthings were the East and West Marches: the Buckland...; and the Westmarch added to the Shire in S.R. 1462. [Most] of the folk of the old Shire regarded the Bucklanders as peculiar, half foreigners as it were. Though, as a matter of fact, they were not very different from the other hobbits of the Four Farthings. Every item of news from the Shire that Frodo could tell... was of the greatest interest to [Bilbo].... They were so deep in the doings of the Four Farthings that they did not notice the arrival of a man clad in dark green cloth. Farthings.... This is the same word as English farthing (Old English feorðing, Middle English ferthing), quarter of a penny; but used in its original sense 'fourth part, quarter'. This is modelled on thriding 'third part', still used of the divisions of Yorkshire, with loss of initial th after the th or t in Northriding, Eastriding, Westriding. 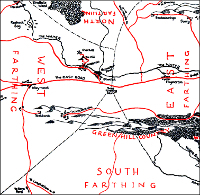 The application to divisions of other measures than money has long been obsolete in English, and farthing has been used since early Middle English for 'a negligible amount', so that to English ears the application to the divisions of the Shire (an area of about 18,000 square miles) is comical.